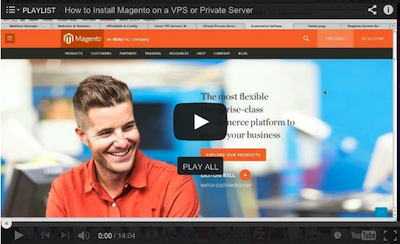 I figured I’d shoot some video tutorials on how to setup a VPS or private server for Magento because of the demand. I know I’ve tried Magento on Godaddy shared hosting and on Hostgator shared hosting and while Hostgator was far better than Godaddy when it comes to shared hosting, it still wasn’t as great as I would have liked it to be — the pages just weren’t loading as quickly as I would have liked. This is mainly because Magento is a resource hog. So if you are looking to spend a bit of money on advertising, you might as well fork up the cash for slightly more reliable hosting also. 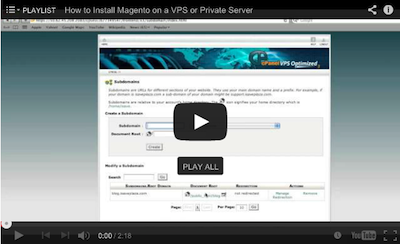 If you need someone to show you how to install Magento on a VPS or private server, simply watch my video tutorials below. I use a Linux economy server from Godaddy running CentOS 6 with cPanel installed. I got a free SSL certificate for a year, so I managed to shoot videos on how to install an SSL certificate as well. Godaddy also offers private servers and from my experience they are great. While Godaddy is far from great when it comes to shared hosting, their VPSs and Private servers are very, very good. As far as WHM cPanel (server control panel) is concerned, it really makes life easy when it comes to installing Magento due to all the PHP extensions that must be installed on the server for it to run. So if you are looking for an interface that is just point and click, cPanel is the one for the job. I have used the Plesk control panel in the past and still do, and while I think it’s really great and about half the price of cPanel, it is definitely more difficult to use for beginners due to all the things that must be done manually. For example, you would need to install all of the PHP extensions and edit your php.ini file via shell. So if you feel up to the task, then go with Plesk, if not, stick with cPanel. You can view a Plesk playlist that I put together on Youtube here but keep in mind that it doesn’t cover installing PHP extensions so if you are looking to install Magento, it’s necessary to familiarize yourself with shell. As for why I chose Godaddy, it’s mainly because I have been with them for many years and have all of my domains registered through them. I also like the fact that their system is automated so I can run all of the tasks without having to speak with customer service. The only thing that isn’t immediate is the initial setup of the server, but even that is faster than with other hosts (at least from my experience). I also managed to get 3 dedicated IPs for free which is great if you are planning on setting up multiple domains on the same server and they give you a free SSL certificate for a year. Other hosts that I’ve used for VPSs or private servers are Hostgator and Myhosting.com (I currently only use Hostgator for shared hosting but have used them for a Linux VPS without a control panel and currently use Myhosting.com for ToPDF.org because I needed the Ubuntu OS — I have the Plesk control panel installed on that one). I know I just gave you a briefing on VPSs and dedicated servers but below is a video on it that actually shows you all of this in detail. Below you can see how I run WHM cPanel for the very first time — the initial setup. I then setup DNS. This is done so that your site is accessible by its domain name. 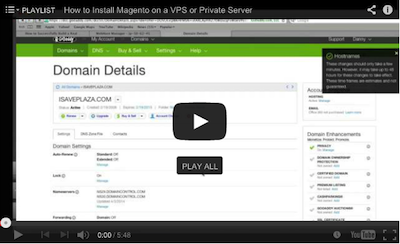 I also show you how to setup nameservers on Godaddy. If you are looking to add subdomains, here is how it’s done. If you ever need to delete a domain, this video shows you how. Here is how I installed the SSL certificate on the server. It shows you the entire process which includes requesting the SSL certificate from Godaddy. Here’s how to setup email accounts and forwarders for your domains. 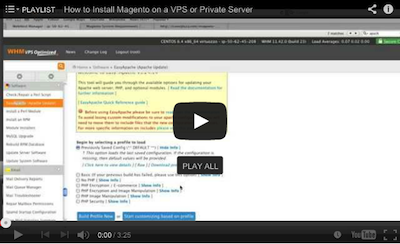 In this video I show you how to configure your server with EasyApache. This is necessary to run Magento. Note that this is what makes cPanel easier to use than Plesk. This shows you how to edit your php.ini file. 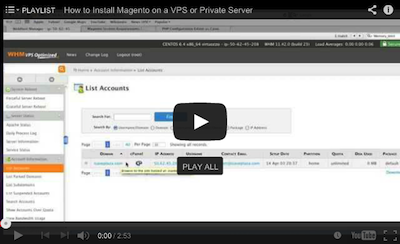 You need a MySQL database setup for Magento. Watch this video to see how. 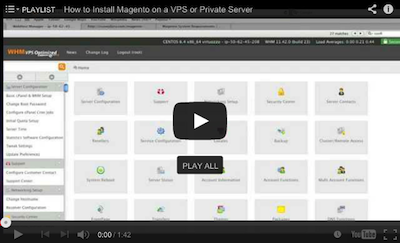 When you are finished with the above, see my article on how to install Magento, which covers cPanel installation as well. Already have a Magento store? 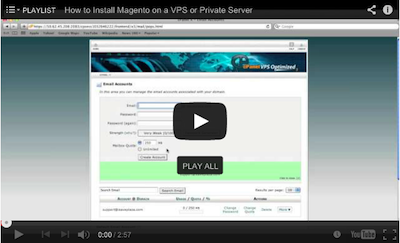 Then you may want to see how to move your store to your new server.